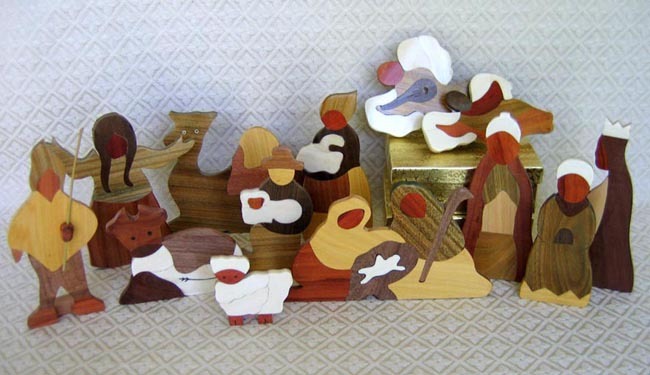 This Nativity set is made from various woods by rural Wichi Indians in northern Argentina. The central piece is the Holy Family with Joseph, Mary, and baby Jesus. Two flying angels (one playing a mandolin) fly overhead; these figures have metal hooks on their backs to attach to stands (not included). The rest of the set consists of two shepherds, two shepherdesses, three wise men, a camel, an ox, and a lamb. The standing wise men measure 6 inches tall. Wood carving in the Wichi community is a gift transmitted from father to son. They use hard woods found in the Chaco region like Palo Santo or Bulnesia Sarmiento (green), Guayacán or Caesalpinia Paraguariensis (dark brown), iscayante and algarrobo or Locust tree (both reddish) and Palo Blanco or Phyllostylon Rhamnoides (light brown or yellowish). The set is distributed by Siwok Crafts in Argentina. The Wichi Indians have lived in the Chaco forest of northern Argentina for thousands of years, hunting and gathering to survive. Recently, the trees in their forests have been cut down to make way for agricultural development so their traditional way of life is threatened. The Wichis are fighting to save their way of life and have begun using their traditional woodworking skills to generate income. Siwok is the Wichi word for woodpecker, which has become the symbol of the Wichi woodcarvers. The project benefits over 100 indigenous artisans and their families.